Whenever I buy tomato “seconds” (nearly over-ripe, slightly bruised tomatoes), I make fresh tomato juice and and/or tomato soup. This Fresh Tomato and Sauerkraut Soup is as easy as it gets — and it tastes wonderful. The juxtaposition of the sweet tomatoes and the salty and crunchy sauerkraut is fabulous! Just a word of caution about tomato “seconds.” Don’t let them sit on the counter overnight or they may be spoiled and moldy by the next morning! But be sure to buy a good sauerkraut so you get the probiotics your body needs. For information on sauerkraut and probiotics, see the previous post on this blog. Pulverize the tomatoes in a high speed blender until you have tomato juice. Pour the fresh tomato juice into little serving bowls (or your could use small cups). Top each serving with a little sauerkraut. You might want to also add some chopped parsley. 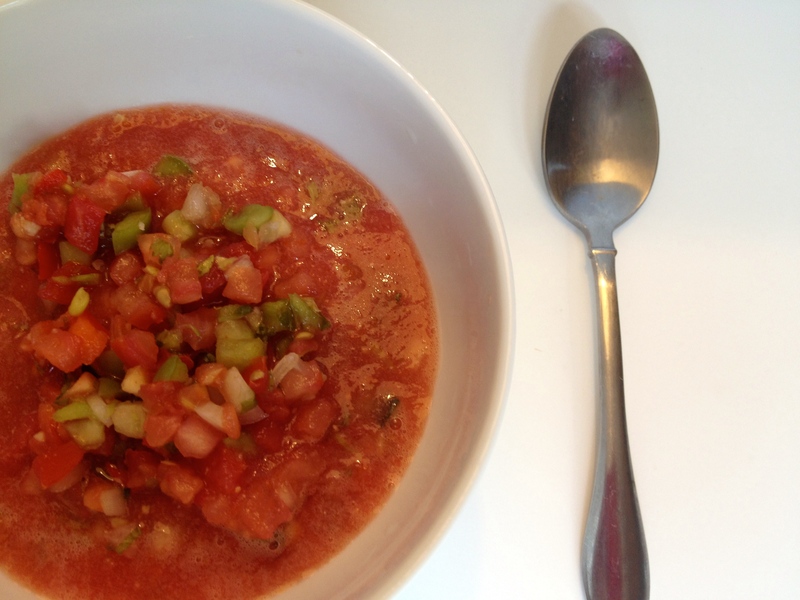 When Tomatoes are in Season, Make Gazpacho! Using the organic tomato “seconds” that I bought at the Reston Farm Market, I made a big batch of the components that go into gazpacho — but I didn’t actually make the gazpacho. Why not? Well, frankly, it’s easier to make the components in the kitchen and then let the diners do the finishing work at the table! And by the way, letting kids compose their own gazpacho at the table is like letting them play with food — and they love it! Step 1. Using a high powered blender, puree the fresh tomatoes until you have a pulpy juice. Step 2. Juice a few fresh limes and then add a little lime juice to the pureed tomato juice. Pureed tomatoes mixed with a little lime juice (as explained above). Cut up veggies for salsa. I used Sunbelt Fresh Organic Salsa from Costco (shown in photo below). If you don’t have this product, then use another fresh store-bought fresh salsa or make your own. The ingredient in the Sunbelt product are: chopped tomatoes, cucumber, green pepper, red pepper, onion, cilantro, lime juice, tomato juice, garlic, chili pepper, salt. It tastes just like cut up veggies. The seasonings are minimal. 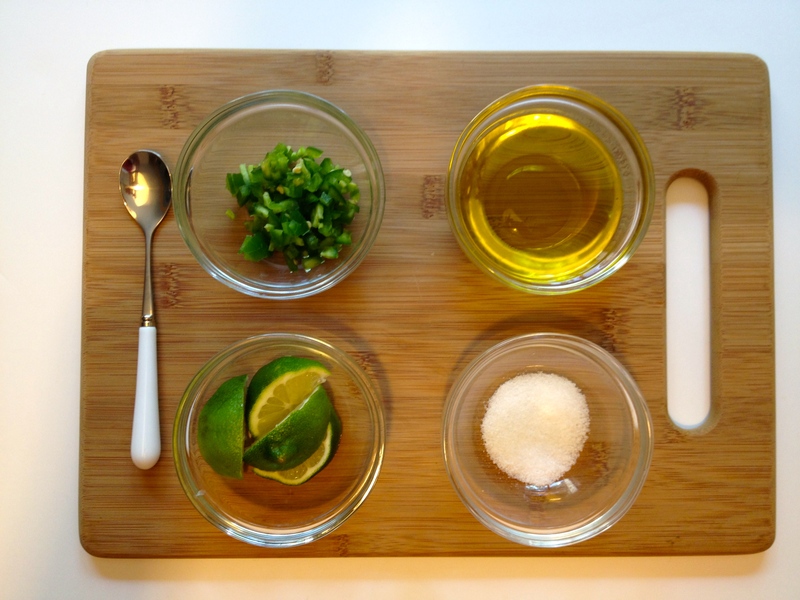 Four fixings: Chopped jalapeno peppers, extra virgin olive oil, lime wedges, and salt. What could be prettier than these veggies from the Reston Farmers Market? 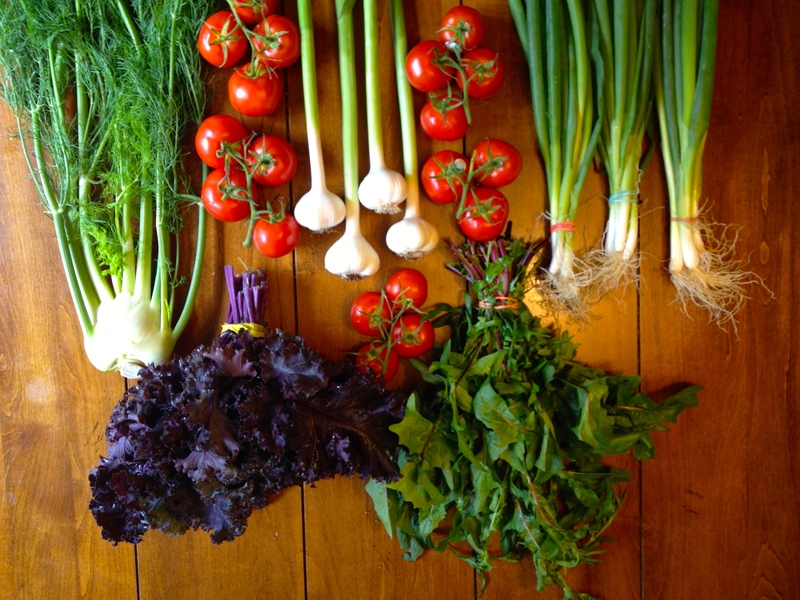 From upper left: fennel, tomatoes, garlic, green onions, red kale, dandelion greens with purple stems. In upcoming blog posts, I’ll tell you why each of these veggies is nutritionally amazing and what I made with each of them.